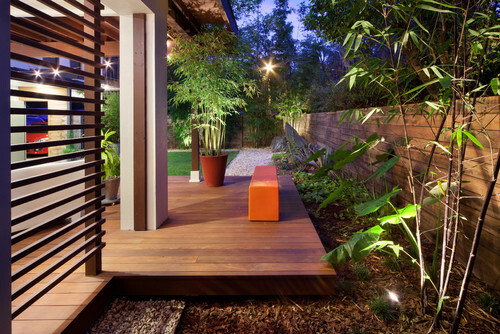 Every room needs a floor, and outdoor garden rooms are no exception. Paths, decks, patios, overlooks, trash can storage pads, lawns, ground cover plantings ... they’re all floors. If you can walk on it, store something on it or roll around on it, I call it a floor. The simplest, least expensive floor material is the dirt that comes with a property. Unfortunately, the problem with an all-dirt garden floor is, well, it’s dirty, even downright muddy when wet. It does have one redeeming trait: It's dirt cheap. But it's highly likely that you'll have to choose something other than dirt for most of your garden. How to decide, given all the options? As with any design decision I make, I look for practicality, beauty and sustainability. As the saying goes, form follows function. So first consider how the surface will be used and what's the most appropriate material to support that use. Loose materials for more casual spaces. 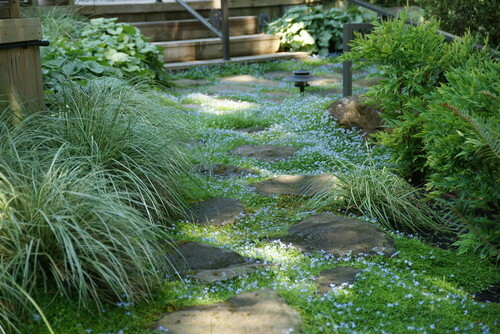 I consider loose materials like crushed rock, graveland shale (also bark mulch) when I want an informal garden pathway or lounging area. They usually cost less and require less labor than other materials, and you don't have to be a master builder to make them look good. But because these materials can be movable after placement, you'll need to do some maintenance to keep them from wandering off. Hard materials for more formal areas. On the other hand, hard materials such asflagstone, brick, tile, concrete and lumber lend themselves to more "civilized" applications like patios, decks and entryways. These generally withstand a lot of traffic and can easily be cleaned with a broom, a washing down (preferably not in water-scarce climates) or an electric blower, if that's your tool of choice. Visual appeal. But we seek more than just utility. The first thing we notice in a garden is its visual appeal and sense of style — not how easily ketchup stains can be vanquished. Take cues from the materials and finishes of your house as well as influences from the natural environment. Environmental impact. Think about where the materials originated, whether they come from recycled sources and whether they are permeable. If you don't know, ask. Cost. For most of us, cost is the elephant in the room. The best advice I can offer here is to notbe penny wise and pound foolish. I've found time and again that a bit more expense (sometimes a lot) on the front end assures that you've selected the best floor for the job, the one least likely to come back and bite you later. Stone. Stone is enduring and elemental, taking many forms. Where a naturalistic style is most appropriate, irregular slabs of flagstone edged with dainty ground covers look right at home. In formal dining terraces, geometric shapes solidly mortared to a slab are a practical solution, assuring that the stones stay in place and provide a level surface. When it comes to selecting the right stone for your project, consider not only the color, but also its surface texture. Too smooth and it might present a slip hazard; too irregular and you'll have a hard time leveling a table (or walking in 6-inch stiletto heels — not a problem for me). 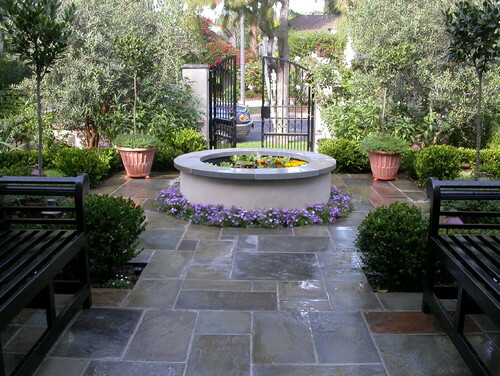 Stability and safety are paramount concerns, so be sure to set the stepping stones on a well-compacted base with some of their mass underground to keep them from tilting and moving around. Check that pathway stones are large enough and ergonomically spaced so you can land on them without having to delicately dance from one to the next. 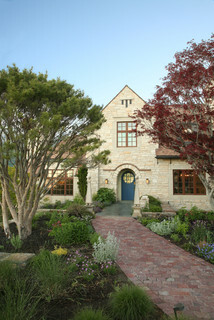 The color of the stone should harmonize with the exterior of your home, other garden hardscaping and natural elements. You'll find a wide range, from nearly black to gray to white, and browns including rusty oxide-infused shades. Brick. 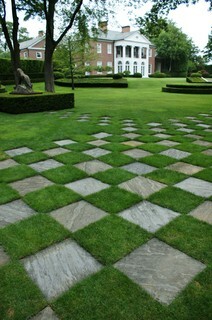 Brick is another durable flooring material that can express the aura of a classic garden. If the visible foundation of your house is brick, use the same brick as a walkway border to bind the house and the garden into a coherent composition. Or you can unleash your artsy, bohemian style by creating random patterns and infusing the design with random sprinklings of other materials, like stone or decorative tiles. If you're the one responsible for rolling the trash cans from the side yard to the curb every Thursday evening, you'll be happy you passed on a pea gravel path and went with a continuous ribbon of mortared brick. The color palette for brick requires additional design decisions; colors include a range of nearly black through gray, brown, red and some yellowish tints. Although individual bricks are rectangular, there are endless patterns to experiment with, including traditional running bond, herringbone, basket weave, radial spokes, gentle curves and whimsical layouts that look like someone pounded down one too many beers at lunch. In formal situations brick is laid on a compacted bed of masonry sand or mortared onto a solid slab of concrete. This approach ensures that the brick will not subside or shift, a critical detail under tables and chairs. For paths the standard approach is to set the outer edges of brick in a solid concrete base, pave the inner surface with brick set on well-compacted mason’s sand and then brush more sand into the joints to lock them into place. For shady, moist areas where moss can cause slip-and-fall accidents, be vigilant about choosing materials, like brick, that can withstand a strong blast from a hose or deep scrubbing with a coarse broom. Caution: Where the ground freezes, loosely set brick can heave, making the path uneven and possibly dangerous. And steer clear of mature trees with surface roots. Tile. 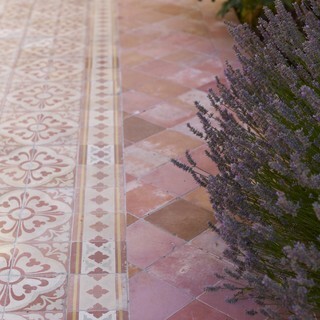 Tile, like brick, offers a broad palette of styles, ranging from crisp, contemporary forms to old-world Mediterranean. Because tile is thin and unable to bear much weight on its own, it is always mortared to a solid foundation. Be careful to avoid slick surfaces, since they can become dangerously slippery when wet. Concrete. Square foot for square foot, concrete is a smart long-term investment. It starts off in a semiliquid state, meaning it can assume any shape. If plain old sidewalk gray isn’t your style, concrete can be textured and colored to look like stone, seeded with pebbles, pocked with rock salt or stained with intense pigments to create bold designs. One problem with traditional concrete, though, is it's impermeable; it sheds water rather than allowing it to percolate into the soil where it can do some good. Decking. A contractor friend of mine calls wood decks “dry rot in slow motion.” He’s pretty spot-on. Traditional wood decks, regardless of how much waterproofing sealant you apply each year, will eventually succumb to nature’s forces (or termites). But if you’ve got a sloping property, need a level surface for outdoor entertaining and want to avoid the expense and disruption of building retaining walls, decking is the way to go. 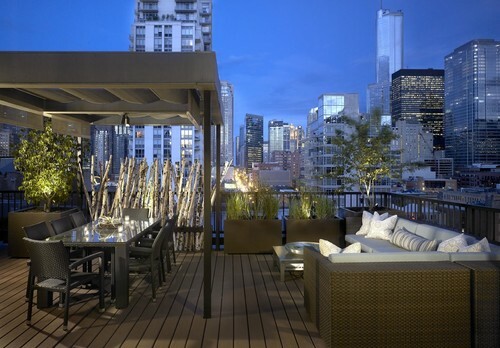 Since you’re not likely to add on to the deck once it’s built, now is the time to decide how it will be used and make space for all the furnishings you want. To avoid the effects of weathering and decay, consider building with manufactured plastic lumber made from recycled bottles, plastic bags and wood scraps. It comes in standard lumber sizes, connects with screws and doesn’t rot, making it ideal for rooftop getaways. 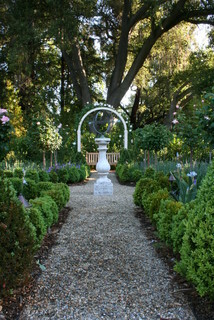 Traditional Landscape by San Francisco Landscape Contractors Frank & Grossman Landscape Contractors, Inc. 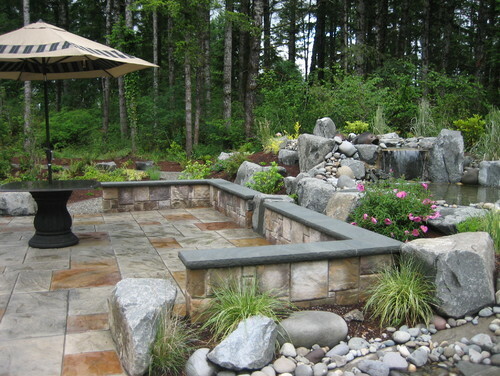 Loose materials.Although they might seem like a low-budget cop-out,loose materials like gravel, crushed rock, compacted shale and decomposed granite can be an inexpensive yet elegant choice, especially whenedged by a richer material, like stone or brick. Advantages include permeability, low cost and ease of installation. However, these materials are more likely to be displaced, especially if water passes over them. And gritty, sandy materials are the last things you want to track onto your hardwood entryway. One of my favorite design treatments for upgrading crushed rock paths uses enriched thresholds and intersections of stone. Plants. In addition to inert materials, there’s all the living stuff. Once again, your choice should be guided by the intended use: Active recreation, for example, calls for the evenly mowed surface of a tended lawn. Another consideration is how "at home" a lawn is in your climate. Where rainfall is dependable and plentiful, you needn't be too concerned about using potable water for irrigation. And there are lots of organic approaches to lawn care, so you can avoid the old-school arsenal of chemical sprays and treatments that can be detrimental to beneficial insects, wildlife and groundwater. But in arid climates, more and more people are going lawnless to help conserve water as well as lower their dependence on fossil fuels for mowing and edging. Meadows, with their tussled, just-got-out-of-bed appearance, are ideal for creating a rustic feeling — and can attract a diversity of beneficial insects and other cool things for kids to discover. 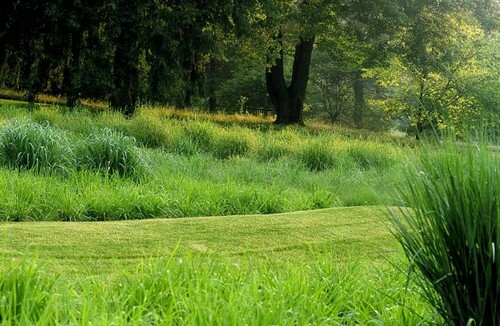 You can walk through them or mow romantic, sinuous paths to explore. 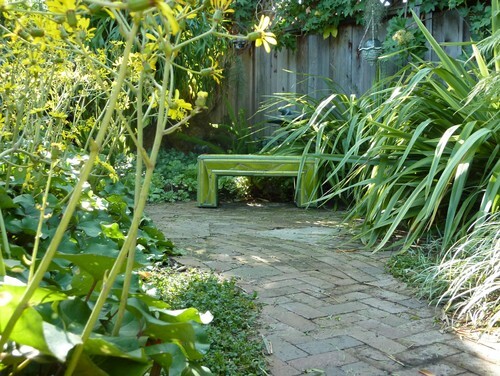 If you don’t need to wander through the space, any combination of ankle-high perennials and ground covers can provide color and an open expanse that will carry the eye across the garden.